Adding a new line to the existing DBF database does not actually require you to install the database management system. In fact, you can use a simpler tool – DBF Viewer 2000. With it you can open literally any DBF file (even corrupted or damaged ones) regardless of the version and the program it was created in. Run DBF Viewer 2000 and open the desired DBF file you’d like to append a record to. This is a “New Record” dialog. DBF Viewer 2000 analyzes the structure of the provided DBF file and automatically parses fields and types of the file. All you need to do is to fill in the information and click OK.
Alternatively, you can duplicate and existing record: first, select the record you want to copy, then click the "Edit | Duplicate record" menu or press Ctrl+F5. 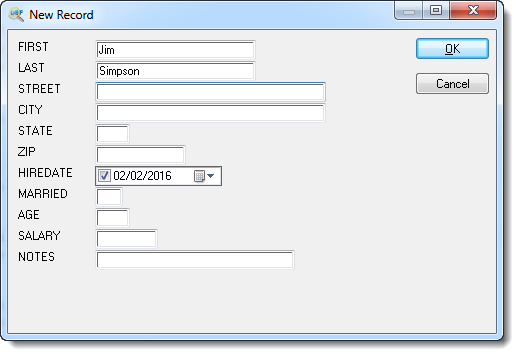 This will copy the selected field data into the new field. If you want to insert a record above the selected record instead of adding it to the end of the DBF file, click the "Edit | Insert" menu or press Ctrl+I. The rest steps are the same as above.